Horse-flies (for other names, see common names) are true flies in the family Tabanidae in the insect order Diptera. They are often large and agile in flight, and the females bite animals, including humans, in order to obtain blood. They prefer to fly in sunlight, avoiding dark and shady areas, and are inactive at night. They are found all over the world except for some islands and the polar regions. 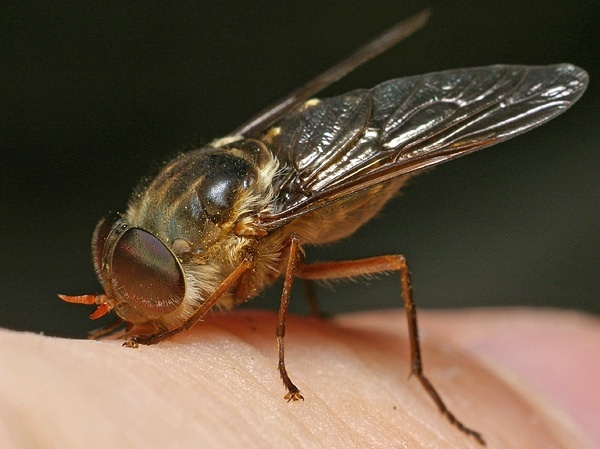 Adult horse-flies feed on nectar and plant exudates; the males have weak mouthparts and only the females bite animals to obtain enough protein from blood to produce eggs. The mouthparts of females are formed into a stout stabbing organ with two pairs of sharp cutting blades, and a spongelike part used to lap up the blood that flows from the wound. The larvae are predaceous and grow in semiaquatic habitats. Female horse-flies can transfer blood-borne diseases from one animal to another through their feeding habit. In areas where diseases occur, they have been known to carry equine infectious anaemia virus, some trypanosomes, the filarial worm Loa loa, anthrax among cattle and sheep, and tularemia. As well as making life outdoors uncomfortable for humans, they can reduce growth rates in cattle and lower the milk output of cows if suitable shelters are not provided. Horse-flies have appeared in literature since Aeschylus in Ancient Greece mentioned them driving people to madness through their persistent pursuit. Shakespeare uses the theme of the maddening gadfly in his plays King Lear and Antony and Cleopatra.